Eliminate Clip Reporting hell! 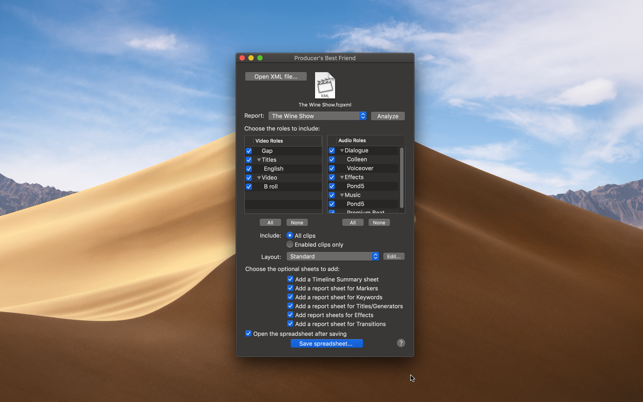 Every Report you need from Final Cut Pro X, in a formatted spreadsheet with no EDL or copy and paste! 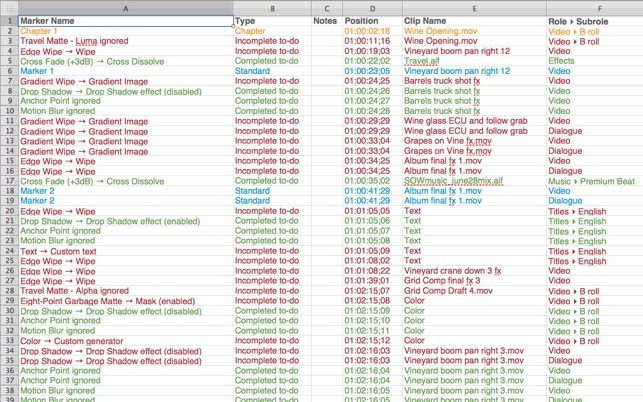 Producer’s Best Friend takes the tedious work out of creating all kinds of clip usage reports. Report on clips in an Event (like Batch List in FCP7), clips in a Compound Clip or clips in a Project in an Excel spreadsheet in seconds. Why spend days doing a boring task when it can take minutes? Producer’s Best Friend can generate music use reports as well as Video and Audio Effects, Roles and Subroles, Transitions and Markers directly to a fully formatted Excel spreadsheet, without the convoluted use of an EDL or copy/paste techniques. 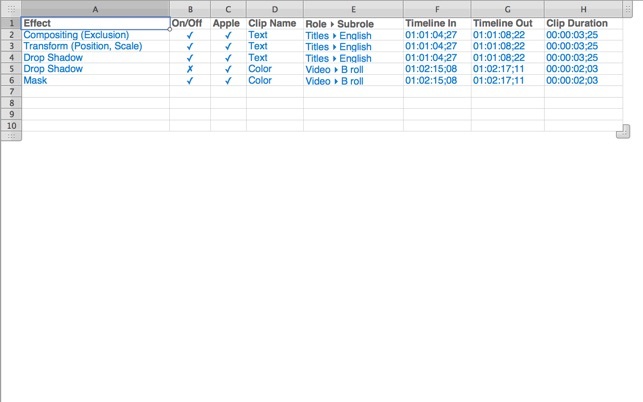 You can choose which Roles to include in the report (Video, Titles, Dialogue, Music, Effects, and any roles and subroles you’ve created), and Preferences lets you choose whether times are displayed as seconds, frames, feet+frames or HH:MM:SS:FF timecode format. • Speeding the reporting of clip usage for music reports, stock footage requests, effects used, markers and keywords with amazing flexibility. Reports are complete in seconds, not hours or days. • Providing full control over the report: choose which roles/subroles are included. • Your clip reports are completed in seconds instead of hours or days. • You have full control over the report: choose which Roles to include in the report(s) including Roles and Subroles you’ve created. • Generate as many reports as you need: create a music usage report; create a report of every clip used in a Compound Clip or Project, or every clip in an Event; report stock footage used, to order the full resolution for online; list out all Effects, Transitions, Titles and Generators used to smooth online finishing (the Apple column shows whether it’s a standard effect or transition compared to one created by a third-party); report all the comments in your Markers. • Generate one report for the whole timeline, or report role-by-role. Reports can be further processed in your spreadsheet application for formatting and additional detail, if required. • Video thumbnail; Role ▸ Subrole, Clip Name, Category (primary, secondary, connected); Enabled; Timeline In; Timeline Out; Clip Duration; Source In; Source Out; Source Duration; Markers; Keywords; Effects; Notes; Reel; Scene; Take; Camera Angle; Camera Name; Frame Rate/Sample Rate; Frame Size/Audio Config; Source File Path; then columns for clip metadata. • Marker Name; Type (Standard, Incomplete to-do, Completed to-do, or Chapter); Notes; Timeline Position; Visible; Clip Name; and Role ▸ Subrole; Reel; Source In; Source Out; and Source Duration. • Keyword; Notes; Timeline In; Timeline Out; Duration; Clip Name; and Role ▸ Subrole. • Name; Enabled; Apple (Apple vs third-party generators); Role ▸ Subrole; Timeline In; Timeline Out; Clip Duration; Font; and Title Text. • Effect name; On/Off; Apple (Apple vs third-party effects); Clip Name; Role ▸ Subrole; Timeline In; Timeline Out; and Clip Duration. • Transition name; Category; Apple (Apple vs third-party transitions); Timeline In; Timeline Out; and Duration. You export the project notes, markers and notes from a FCPX project via XML into Producer's Best Friend which then it generates reports of everything in Excel format. 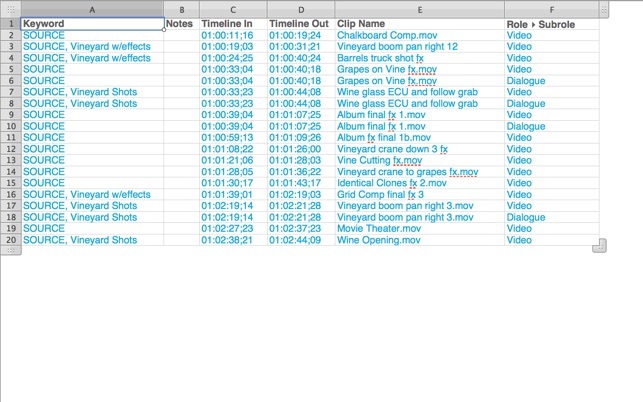 So in seconds you have a list of things to do, clips that you've used, transitions, with times, durations, everything all in a spreadsheet. I take the spreadsheet, move the columns around, remove those I don't need, and (exporting via a .csv file) start it up in an outliner (Novamind, which will import from a text file) so I can start a paper edit using my favorite Outliner app on the iPad, so I can do that with all the notes that I've made on the clips, mull that over then go back to FCPX to finish the edit. I prefer to do the thinking in an outliner first, and because I'm outlining with all the actual timings and notes and markers from the project, the paper edit is very easy to put together,. The spreadsheet is a good intermediate as you can rearrange, format, edit, search to your heart's content on the data without touching any clips. You don't need a database, Numbers is plenty good enough. The outliner is really fast for grouping information about clips, thematically, to-do's, notes, ideas. Producer's Best Friend is worth its weight in gold, many times over. This application saved days of work for me! One of my jobs was a collaboration on a large archive. The individual I was working with didn't have a list of what he caputured for me to edit. There are hundreds of videos contained in three separate Final Cut Pro X libraries. I was able to export three XML files and generate three spreadsheets within minutes. I sent the spreadsheets off for his review, and that's it! Job done! I can see many applications for this. It will be a huge time saver for my FCPX archives! I downloaded this app a few days ago, and within only a few minutes, it proved its worthiness, and paid for itself. I had almost 150 clips to go thru and organize into shorter segments of 2-6 clips. In FCPX i keyworded every clip. I had no easy way to organize all of my clips based on their metadata . 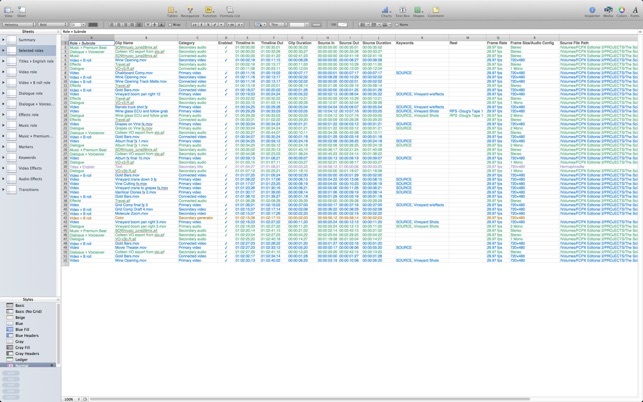 “Producers Best Friend” allowed me to export my everything into a spreadsheet, where I was very easily able to sort thru everything. It saved me at least 3 hours of work.